New, original music with a West African vibe. The AfroFlute Project is my latest music creation, featuring original compositions for the Fulani flute, balafon, djembe, and more. Inspired by more than a decade of immersion in West Arican music styles, it’s an ongoing personal project that I’ve become quite passionate about. In addition to writing and performing these songs on instruments I learned how to play in West Africa, another unique aspect of this project is that I constructed all the flutes that you hear specifically for this project. I’m near completion on the first handful of tunes, with more in the works. Below are rough mixes of the first four songs for you to preview. Enjoy! Comments welcome. An original composition inspired by the “Fuuta Jaloo” — the traditional name for the mountain region of Guinea. It is sometimes referred to as the “Tibet of West Africa” because of the spiritual and mystic traditions of the region. I like to imagine the rugged, winding road through the West African mountains when I listen to this song. An original composition. “Soli” is a family of traditional Malinké rhythms used for initiation, and “Douada Condé” is the name given me to my friends in Guinea. I was thinking about my “initiation” into village life over the course of my many visits, and I thought this song was a fitting tribute to my experiences. This is my own arrangement of the traditional Sorsornet rhythm and song, but I’m paying tribute here to a famous (but hard to find) version done by Les Ballets Africains many years ago. I start the piece with a slow, melodic tribute to the song Fama Denké, which then leads into Sorsornet. Original composition. Donso means “hunter” in Manden’ka, and the bolon (3-stringed bass harp) heard on this tune is their instrument. I’m enchanted by the hunter’s music in West Africa, and I’ve composed a series of “Donso” songs that pay tribute to it. This is number 11 in my series. Below are a few of the instruments used on these recordings. Click the images for a full-size view. 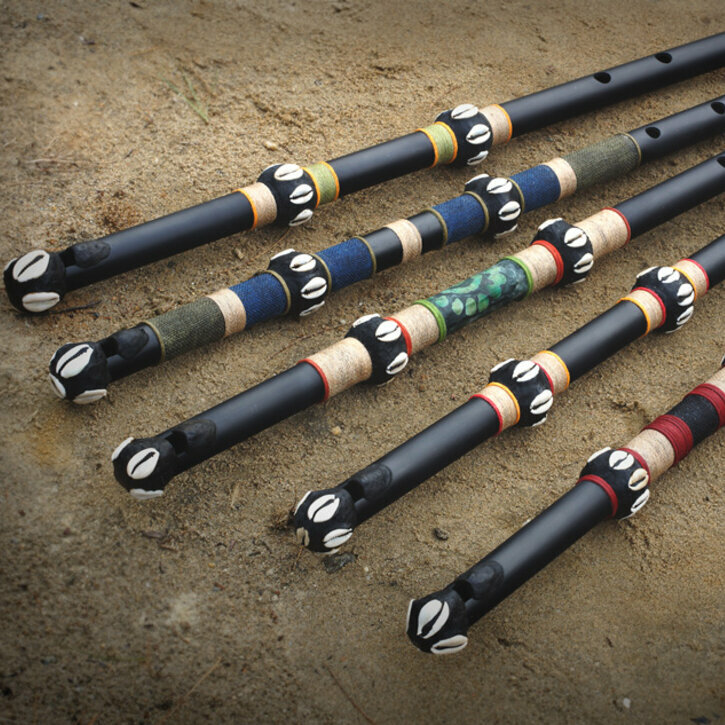 These are some of the flutes that I made specially for the AfroFlute project recordings. Learn more here. 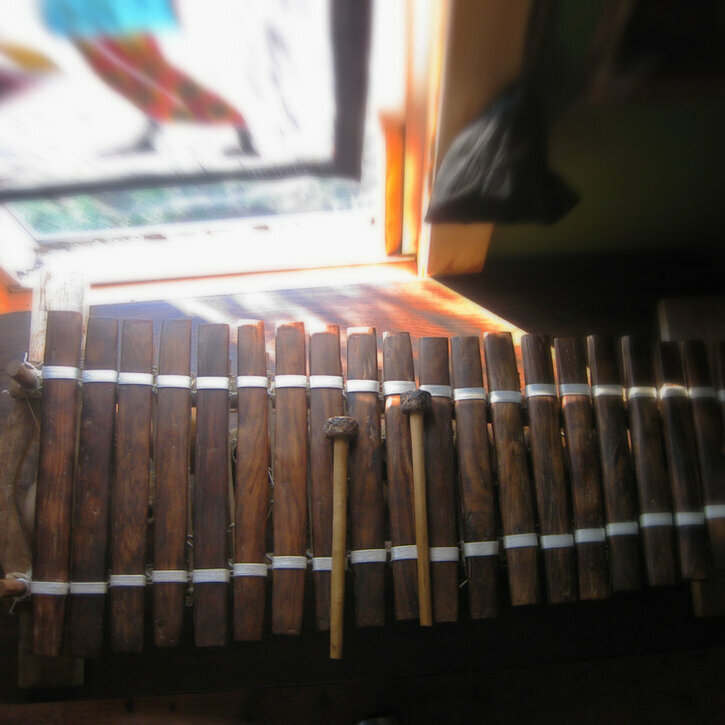 The balafon is a wooden xylophone originating in Mali around the 14the century. 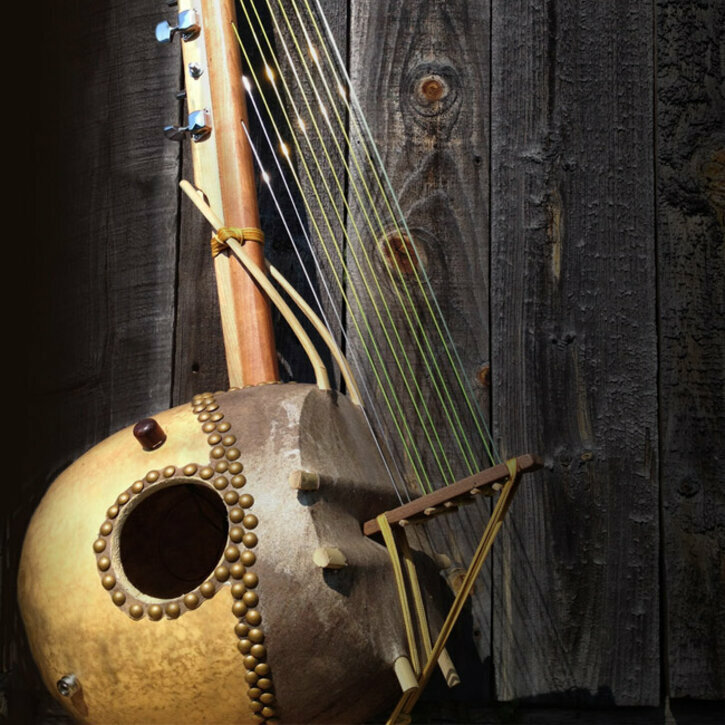 A 10-stringed harp-like instrument originating in the Wassoulou region of Mali.